From its discovery in 1930 by American astronomer Clyde Tombaugh until 2006, Pluto was considered equal to the eight other planets of the solar system - the furthest one from the Sun, taking 248.1 Earth years to complete one (admittedly odd) orbit. Like many other worlds in the region, it hosts moons: Charon was identified in 1978, with Nix and Hydra discovered in 2005. However, astronomers eventually concluded that Pluto was actually the largest body of a much bigger collection at the fringes of the solar system - rocky, icy objects remaining from its formation, that together make up the Kuiper belt. Therefore, in 2006 Pluto's status was reassigned by the International Astronomical Union to 'dwarf planet' - something with enough mass to become spherical, but which has not through its own gravity 'cleared the neighbourhood' of other objects around it. Pluto has a highly elliptical orbit that is outside the plane of the eight planets: its orbit is 3.282 × 1010 kilometres, with an orbital velocity of 4,749.0 m/s. Its nearest approach to the Sun brings it closer than the planet Neptune. Its average distance from the Sun is 5.9038 × 109(39.433 astronomical units (AU)) kilometres, with a perihelion of 4.43682 × 109 km (29.658 AU) at its nearest approach) and an aphelion of 7.37593 × 109 km (49.305 AU at the time it is furthest from the Sun). It has an equatorial circumference of 7,232 km, a volume of 6.390 × 109 km3, and a calculated mass of 1.27 × 1022 kg. With its significantly lower mass, its gravitational force with an escape velocity of 1,270 m/s (2,840 mph) is much lower than that of Earth, which has an escape velocity of 11.18 m/s (25,022 mph). Pluto's surface gravity is only about 8% that of Earth. If you weighed 100 kilograms on Earth, you would only weigh 8 kilograms on Pluto. Pluto's day (sidereal rotation period) is about 6.387 Earth days or 153.3 hours. However, its rotational direction is retrograde, the opposite to that of Earth. Pluto has an extremely thin atmosphere and its minimum surface temperature is about -233 to-223 °C. In the 1970s, spectroscopic observation from Earth revealed that the planet surface is covered with methane ice which exhibits a bright coloration. During an eclipse by its moon Charon, the frozen methane surface, with the exception of the polar caps, was observed changing to a dark red. Pluto has a small iron-nickel alloy and rock core encased in a very thick layer of ice. Pluto has three known moons, the relatively large Charon, discovered in 1978, and the much smaller Hydra and Nix, discovered in 2005. Charon (smaller object) and Pluto. Charon is not exactly a satellite because it and Pluto orbit a barycenter above Pluto's surface. This makes them a binary system. Charon has a diameter of about 1,186 km (737 miles), a little more than half of Pluto's. Pluto and Charon’s gravity have them joined in a mutually synchronized orbit so that they are always facing each other on the same side. Many of the moons in our own solar system, including our own, keep the same hemisphere facing the planet they orbit. But Pluto and Charon is the only case in which the planet always presents the same hemisphere to its moon. From a human perspective it would like the other appeared to hang in place and never cross the sky. Charon is named after a figure in Greek mythology, the boatman who carried the souls of the dead to the underworld. In Roman mythology, the underworld was ruled by the god Pluto. The name was suggested by James Christy of the U.S. Naval Observatory after he found the moon in 1978. In 1985, Pluto and Charon began eclipsing each other from Earth's point of view. This continued for five years. The sequences of eclipses made it possible to measure their diameter and mass as each passed in front of the other. Charon is apparently covered by water ice. Pluto, on the other hand is covered with frozen nitrogen, methane, and carbon dioxide. 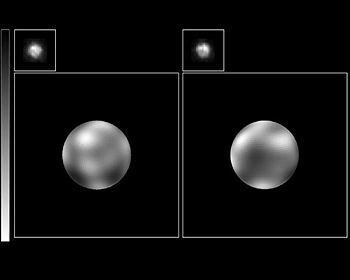 One possible explanation for the difference is that the materials that formed Charon were in fact dislodged from Pluto in a collision in a manner not unlike the formation of Earth’s Moon. ↑ NASA: 'Solar System Exploration - Planets - Pluto'. ↑ This is about 35.505 that of Earth. ↑ About 0.425 that of Earth. ↑ -387 to -369 °F, or 40 to 50° Kelvin. ↑ NASA: 'Solar System Exploration - Planets - Pluto - Facts & Figures'. This page was last modified 22:32, 19 March 2014.